Creamy homemade mascarpone cheese is easy and fun to make right in your own kitchen — use it in all sorts of authentic Italian recipes, both sweet and savory — and save a lot of money while you’re at it! You know I love me a good DIY project. This one was especially satisfying because mascarpone, the creamy Italian soft cheese, is such a high end product. It can be hard to find, and it’s expensive when you do. You probably know it as a critical ingredient in TIRAMISU, and I l love to sneak it into RISOTTOS to give them a rich finish. 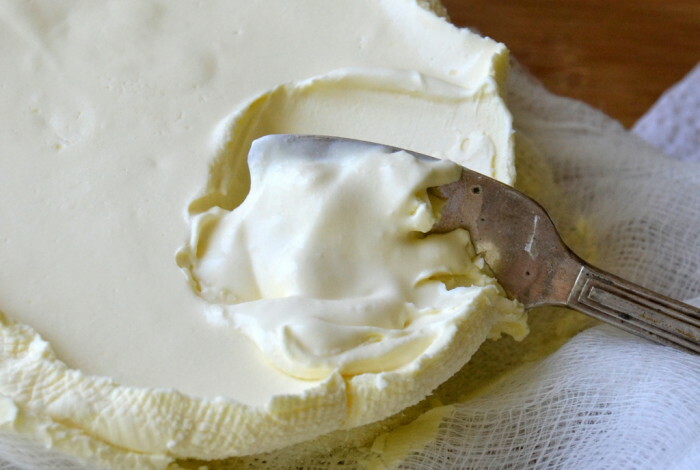 Mascarpone is called a ‘cheese’ in the technical sense, but it is very close in flavor and texture to a British clotted cream, so it’s perfect on scones and biscuits, too. 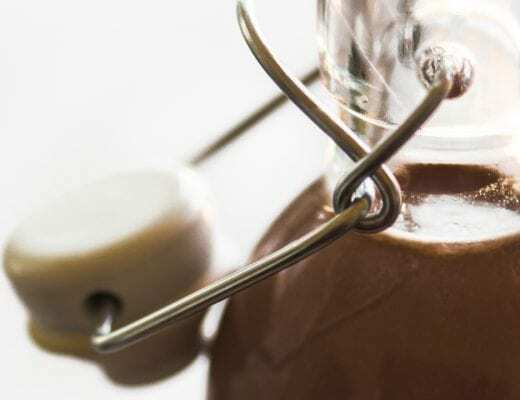 To qualify as a great DIY project a recipe has to be relatively easy to pull off, and the finished product has to be a spot on version of the original. This homemade mascarpone ticks both boxes deliciously. You will need a couple of pieces of equipment — a clip on thermometer for the pan, and a piece of cheesecloth for draining the cheese. You are going to be bringing heavy cream up to a boil, and then adding lemon juice to coagulate and thicken it. There won’t be any actual curds, because heavy cream doesn’t curdle like milk does. You’ll drain it to remove any whey, and then you are left with an incredibly rich cheese. All cheese making recipes specify using heavy cream that has not been ultra-pasteurized as the starting point. It’s one of those truisms that gets passed from recipe to recipe. Ultra-pasteurizing just means that the milk is flash heated to a higher point than regular pasteurization. Almost all heavy cream is ultra-pasteurized nowadays, because it results in a longer shelf life, so finding anything else can be a challenge. I actually made my first batch with regular heavy cream because I am an impatient sort, and it turned out almost identical to the next batch I made with the non-ultra-pasteurized cream I found at Whole Foods. The only difference I could tell was that the ultra-pasteurized cream resulted in a lightly softer end product. So make what you will of that. Common wisdom says to use non ultra-pasteurized cream. 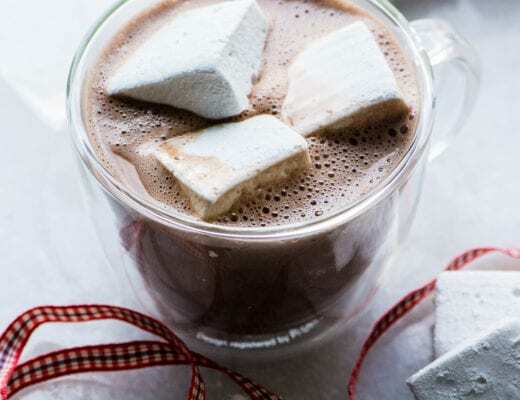 Pour the cream into a small heavy bottomed pot and heat on medium until it reaches 190 degrees on a candy thermometer. Heat the cream gently so it doesn't scorch. Add the lemon juice, and keep the cream at 190F for another 5 minutes, stirring gently. I found it easiest to keep moving the pot on and off the flame to maintain the temperature. The cream will thicken and coat the back of the spoon. Let the cream cool to room temperature, which will take about half an hour. 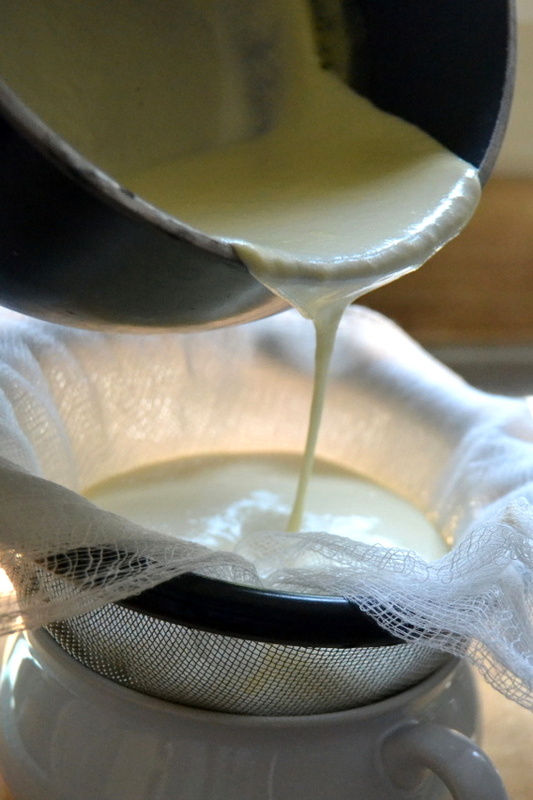 Line a mesh strainer with several layers of cheesecloth, and set that over a bowl to catch the dripping whey. Pour the cream into the cheesecloth. Cover loosely with plastic and refrigerate for 8 hours. 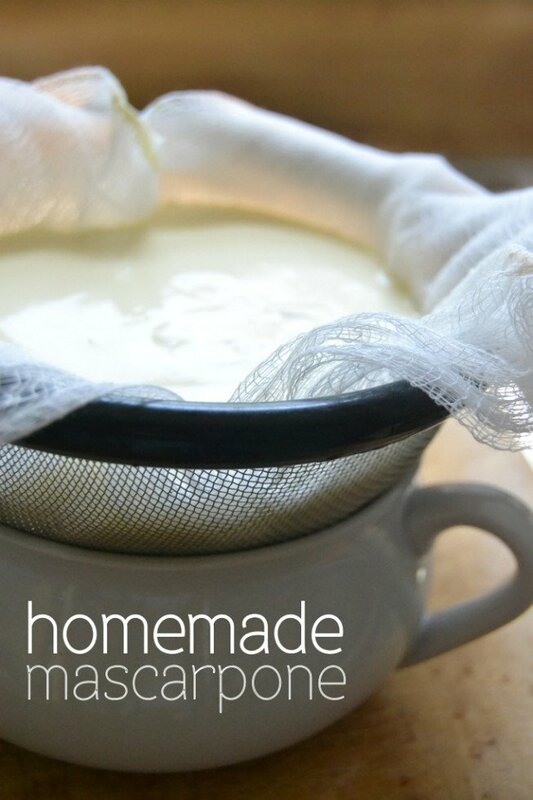 Remove the cheese from the cheesecloth and keep in a tightly closed container in the refrigerator until ready to use. Plan to use the cheese within a week or so. I love the idea of using my homemade mascarpone cheese in this Low Carb Mascarpone Mousse with Roasted Strawberries. Don’t forget to pin this Homemade Mascarpone Cheese! Going to a Sunday dinner next week to an Italian friend of ours. I normally make the dessert and this year along with my signature 100+ year old recipe little layer chocolate cake with this year being in Easter colors alternating layers pale green, yellow(normal), pale blue and pink. I’m also going to make a Kahlua Tiramisu with homemade mascarpone. Should be great with such a GREAT recipe!! Is there room for a plus-one?? Can I use heavy whipping cream in place of heavy cream. How much difference will it make? You can use those interchangeably Jk. I need 32 oz (about 4 cups) of marscspone for a recipe. Can I quadruple your recipe and still have it set properly, or make it 4x or something in between? I would just do it in separate batches, meaning do it in separate containers to be sure Kathryn. Can you use lime instead of lemon to make mascarpone? I have no idea, why don’t we try? Can I use oven to set the temperature to 190 and then put the heave cream pan in the oven? It’s hard to keep the temperature to 190 above stove. That’s worth a try Jane! I’m going to use my sous vide to get the cream to reach and stay at 190 – that’s the beauty of a sous vide and you don’t have to worry about the cream burning or taking the pan on and off the stove. Just set it to 190 and it stays there. I also use my sous vide to make yogurt. Thank you so much for this recipe. Mine came out all right and I am thrilled because I use mascarpone to make sponge cake that my daughter loves. One question, more out of curiosity. My mascarpone has a stronger lemony taste than commercial mascapone. Do you know why commercial mascapone doesn’t have any scent or taste of lemon? Thanks. Hey Lauren ~ I believe that’s because commercial mascarpone is made with citric acid, a natural chemical similar to lemon juice, but without the fresh lemon flavor. You can actually easily buy citric acid and try that yourself. I bet your sponge cake is wonderful! Thanks for posting this recipe; I’m definitely going to make my own. I found this site because I was searching for why mascarpone is so expensive – I still want to know why it’s so expensive? Does it come all the way from Italy maybe? Great question, Faith, I just bought some the other day that was made in Wisconsin, but it was still expensive! Where can I find non pestorize cream.? 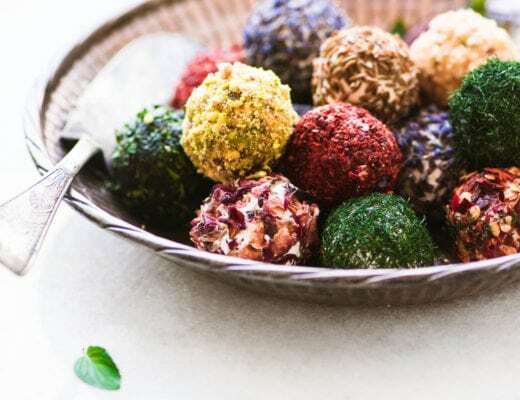 If you have a health food store nearby, check there, Aynur. I don’t have cheesecloth, can I use a coffee filter in my strainer? I’m excited to try this! I think a coffee filter would take a lot longer, and I’m not sure it’s big enough, Pamela, but more power to you if you try! Great Recipe! The cheese is great! I plan on making mascarpone ice cream with fig! 190 degrees… Celcius or fahrenheit? ? that’s 190F Christina, I just updated, thanks! This looks terrific.. two questions.. we have our own cows – can we use the cream that we skim from our cow milk when pasteurizing this to make the mascarpone? and second, do you know how many ounces of mascarpone each recipe makes? I’m sure the cream from your cows will make a spectacular cheese, Estelle — how lucky you are! And I think the recipe makes about 8 oz of mascarpone. Have fun! lovely recipe! already printed and added to my favorite research cookbook. but I’m curious—-is there anything to be done with the whey? There isn’t very much whey left, actually, so I just discarded it. You can definitely use it in soups and stews, or smoothies if you like! Your mascarpone looks incredible! Who knew it was so easy to make at home? Must give this a try! Sue, next time I make tiramisu I’ll be sure to use these directions for my own mascarpone! Looks wonderful! Tie me down. I want this NOW!! OMG, it looks so creamy and perfect and does look like clotted cream! Another one on my list! I can’t keep up, Sue! this is my most favorite thing EVER!! I never thought to make my own mascarpone Sue. Great idea. Beautiful photos. I love making my own mascarpone! It’s so easy and a good price compared to the bought stuff. I must remember to put it in risotto at the end! wow…it has turned out so creamy and smooth! Well done, Susan. Mascarpone is the BEST! And it is so expensive too–I NEED to do this asap. Love this post! It is always so fun to learn how to make some of these basic grocery store staples at home! I need to make this now! i didn’t know it could be this easy. I mean wow- you are going to change me into a homemade mascarpone girl instead of store-bought! lOL! I rarely buy mascarpone as it is so expensive – I avoid recipes requiring it. What a find this is, and what great photos. Hi Sue, this is something that I never would of thought to make myself and it is so hard to get ahold of here. What a really great idea!!! What a fun and beautiful post! I am a DIY project nut – and I’d totally shmear this on some bread with some jam. One of my favorite dinners is pasta with mascarpone and asparagus. While the pasta cooks, warm mascarpone either by placing it in a bowl sitting on top of the water the pasta is cooking in or in the microwave. When it’s very soft, stir in lemon zest and juice and fresh-ground black pepper to taste. Toss asparagus in with pot with pasta when the pasta has a minute or so left to cook. Stir grated parmesan cheese into the mascarpone/lemon. Drain pasta/asparagus, dress with mascarpone/lemon. Voila! It is so good! I’m not giving specific amounts because you all are clever people, and amounts depend on how many people you are feeding. Oh wow. Just wow! I now know what’s for dinner! Aww, Karen you’ve made me drool all over my keyboard. Now I’m off to the store to get what I need to make the mascarpone and your pasta recipe for dinner tonight! That’s interesting. I did read that ultra pasteurization can give a slight ‘cooked taste as a result of the high heat. Maybe the heat affects any tanginess, too. I rarely buy mascarpone because it is so difficult to find a really good brand and when I do, it is usually very expensive. 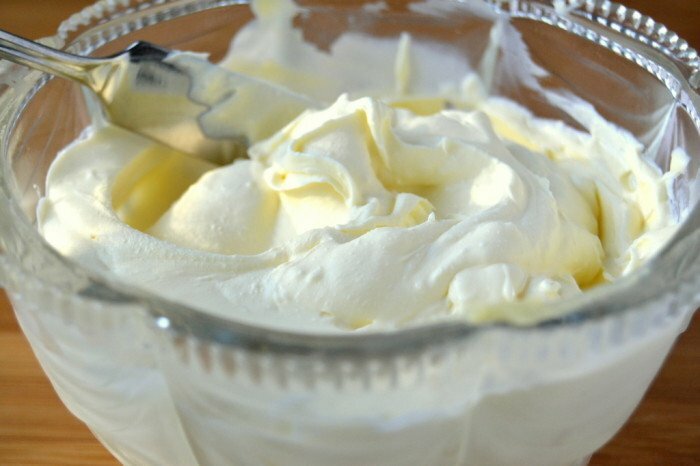 Now, I can make my own very creamy, very delicious, very quick mascarpone! Thank you, thank you, Sue!! You know I spent time in London and developed the same taste for clotted cream, too. I looked into making it and it’s very complicated, so this is a really great substitute! I rarely make cheesecake, but that’s another great use for this!